Good employees are always a value added asset to the company. Not only do they help the company deliver results but also help in increasing the growth and profit of the company. Best performers have a positive impact on the work environment. Some top companies report that the top performers outshine the average ones by more than five times. This means that the top performers are more productive at work and their share in the company’s growth and success is more than 25% of the total. That is no secret. The top performers are the main target drivers for a company and the company heavily relies on them for its profits and growth. The rest of the employees are dependent on successful people for guidance and help. The hard efforts and work ethics of the top performers encourages the rest to incorporate them into their line of work. The top performers act as natural motivators and are a great asset to the company. What are the attributes of best performers? The best performers always push themselves harder and are hungry to learn more. They go beyond their capabilities to achieve targets and are great thinkers. So what are the attributes that make them the top performers? Ready to take the initiative and committed. So then when top performers are able to make such a huge difference, it becomes sensible to hire more of them so that your company grows. But now comes the difficult part. How do you hire more best performers? What are the preparations that go into hiring them and how do you know that the candidate is the right person to fit in your company? How to Hire the Best Performers? The work culture is one among the topmost criteria when a person wants to join the company. The work culture should be assimilating, non-biased, performance based, encouraging, comfortable and friendly to work with. Only when such a work culture thrives, the performers are ready to join your company. 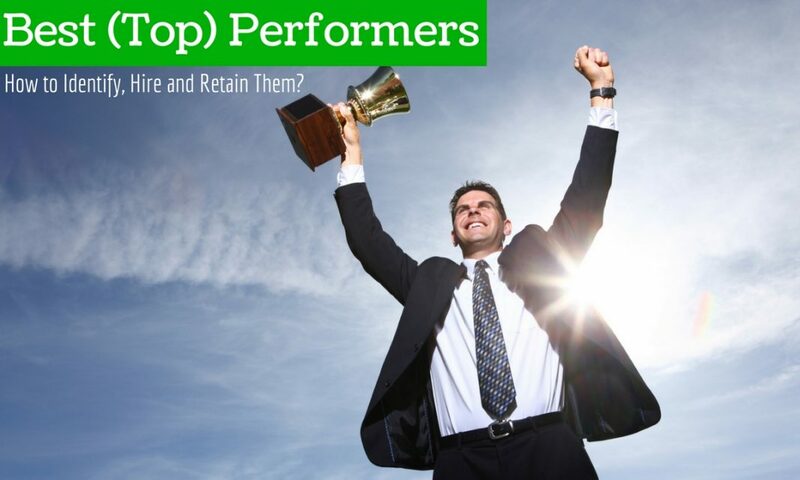 This way you will be able to retain the top performers also. Meaningful work and projects assigned to the employees give them varied work experience. The work should be challenging and innovative enough for the employees to be interested in. When your company provides some real tough tasks, then the employees get attracted to such job offers. This is one of the tactics involved to hire best performers. Give them the assurance of promotions and career enhancements. So if your company is able to provide the employees with promotions and regular hike in salaries, then candidates will be ready to take up the task. You need to constantly upgrade technology what you will be using in your services. You need to provide training to the employees to keep them abreast of all the latest developments and use them in their skill sets. When the candidates know that your company is constantly upgrading and providing required training to employees, then the candidates will feel that the job is definitely worth a try. performers. Compare them with the rest of the employees. How superior are they in comparison to others? How much do they contribute to the overall success of the company? How many more best performers do you want in the company and in what areas do you need them? When you do such regular assessments then you get an idea as to where your company is lacking in talent pool and which areas needs improvement. This can be covered by hiring top performers. Relate the skill sets you need, to their skill sets. Are they under qualified? Do they have the relevant technical skills? Are they in tandem with the latest developments in their field? Apart from the technical skills, check if they have good analytical, creative and conversational skills. Only skills aren’t enough when working for a company. They should share good values too. Otherwise the company suffers in the process and it affects the other employees too. Yes, they should be passionate about their job. They should be avid learners and hungry for knowing and learning every aspect of their field. Only when people have a passion for work, do they succeed. Does the candidate own responsibility for his faults? Is he punctual to work? Does he respect his seniors? Learn about the work ethics a candidate possesses. Check out for the candidate’s work experiences. How relevant is it for your company? Will the company benefit from his work experiences? As vast and varied the work experience is, so will the company benefit from this. You know how efficient the employees working in your organization are. Make an assessment of the employees and see how capable they are. Measure their performance standards and set a bar for the candidate. See that your required candidate not only measures upto but exceeds the standard what your employees have set. Only when you aim higher, you get to hire the best performers. The company will also benefit tremendously from it. Incentives to the current employees for referring to a good candidate. Social media profiles like LinkedIn or Facebook. Colleges in and around your locality. Posting on your company website. Though this is a time consuming process, still do it to find the right candidate. Because you being lazy or negligent now may prove to be costly later. Take time to go through their bio-data in detail. What skill sets do they have? What are their job experiences? Will their skill sets and work experiences be an asset to your company? Some candidates will have some unique skill knowledge which can be put to good use in the company. All such detail checking of their resume will help you know if the candidate is hirable. Do you know someone from the organization where the candidate is working? Then you can talk to them about the candidate’s skills. Often the candidates mention some references in their resume. Do not neglect those references. Do a cross-examination of the candidate through the referrals and confirm if they are a potential candidate fit enough to be hired by the company. When the candidate appears for the interview, prepare a structured framework about the type of questions you would want to ask. Apart from the behavioral assessment, you would want that the candidate is thorough in his technical skills as well. When conducting the interview, try getting the relevant persons as interviewers. You wouldn’t want a non technical team to review the candidate’s technical skills and come out with their assessment of the candidate’s performance. So you need to prepare ground before asking the players to race. Interview is a tool to assess the capabilities of the candidate and know how well he will fit into your company. So ask relevant questions to know about the ability of the candidate and judge if he is a perfect fit. 9. How serious is your candidate? Is the candidate really serious about taking up the job? How many jobs has he hopped before previously? Were the reasons valid enough? The candidate should have a hunger to learn and absorb new things. He should have good work standards. It would be advisable to ask the candidate the reason for shifting jobs. It helps you know what his problems are while dealing with the job. It keeps you prepared to know his weaknesses and strengths. Only if you provide him with a good work environment will he perform well in his job. Know what the reasons are why he is interested in this job offer. Check if salary was the only criteria or if the candidate is genuinely interested in performing well. Social media is a great tool to understand or to get an insight into the candidate’s professional and personal life. There are some good social media sites where the candidates are generally active and this gives us a fair idea about their tastes and preferences, their work culture and their hobbies and interests. This can be used as one of the measures to assess if they will fit into your company work culture. When you have decided to hire the top performers see to it that you offer them positions fit for their skills. Make their work more challenging and interesting if you need to retain them in your company. See that they are competent enough to fit into a position where your company prospers. When they are offered such challenging tasks, they continue to grow and in turn they help your company reap benefits. The way you are preparing to hire best performers, know that the potential candidates are also trying to find how good your company is. So always see to it that your company has good reputation and impression in the society. Also the former and current employees need to make it known to the outside world about how good your company is. If the company has a bad review, it is likely to deter the potential candidates from seeking employment with your company. Try improving the work culture in your organization so that it gets good reviews and helps in attracting talent. For the success of your company you should be successful in hiring the right candidates. And only when you are able to hire the best performers from among the talent pool, the company will be able to make profits.